The world changed dramatically in 1989. That’s when Time Berners-Lee, a software engineer at CERN, a large particle physics lab in Switzerland, invented the World Wide Web. Of course, that revolutionized how we communicate, an idea hatched originally by Berners-Lee so that scientists taking part in CERN experiments could exchange data and results via computer once they’d returned to their home labs across the globe. Just four short years later, in April of 1993, World Wide Web technology was available to anyone royalty free. The evolution of this revolutionary phenomenon made necessary the design of individuals websites, a practice that will always continue. 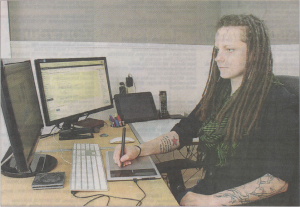 And that’s the chosen career of Riverview’s Cassie Ward of Inkedkoi Designs (www.inkedkoidesigns.ca). Born and raised in Edmonton, Alta., and moving to Moncton to 2007, she explains what she can accomplish as a web designer. “I have the ability to present your business through the Internet as a functional, stylized presentation of information about your company and having it available 24-7 globally for everybody. Nowadays it’s an utter necessity for a business to have a functional, well-designed cohesive website, or even a social media presence like Facebook to maintain your customer base. Cassie points out that it’s always better to hire a professional to present you online in the best possible light and ensure that your website is user friendly for the convenience of your customers. The last thing a business wants is frustrated customers leaving their website because of lack of functionality and cohesive presentation. Cassie began her interest in web design in late 1998 and was largely self-taught. In 2005, she studied offset printing and, continuing to expand her knowledge base, earned honours in Graphic Design in 2012 from McKenzie College School of Art & Design in the Hub City.